Stop! Don’t Prune Those Trees! Wild babies need trees… maybe even yours! Is there a tree or bush in your yard that needs some pruning? Planning to trim it this weekend? WildCare asks you to please stop and consider the time of year– if it’s spring or summer, animals of all species may be using your tree as a nursery even as you read this! Every spring, baby animals that have been orphaned or injured because their nests were damaged or removed arrive at WildCare. Most people are appalled to find they have caused these accidents, especially when the injury to wildlife is so easy to prevent: just procrastinate! Wait until resident wildlife have raised their broods, or even better, until nesting season is over. If you’re facing an active nest, it really won’t be long–usually just a matter of weeks. Before you cut that tree, take a look to see if there are wild families already living there. If so, give them a chance to grow up and move out. 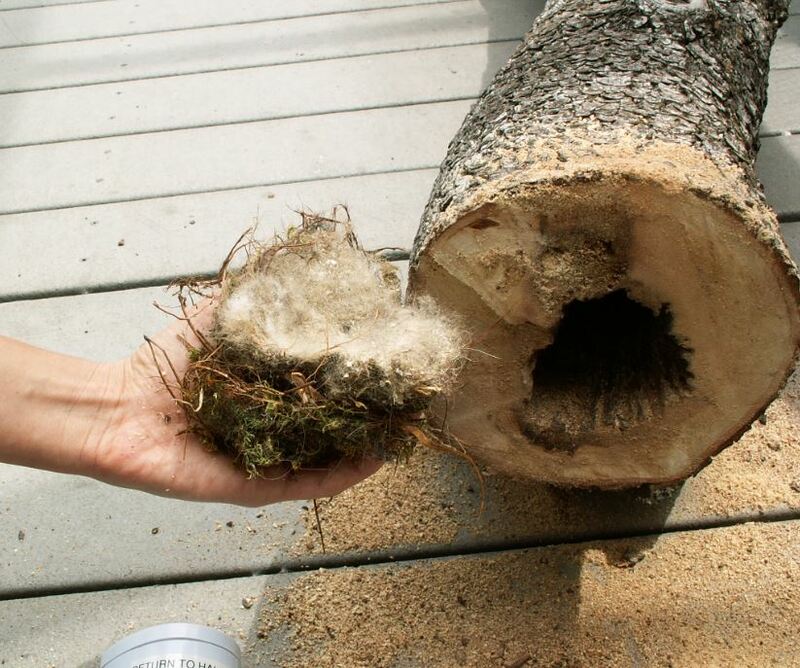 Some species of birds (especially raptors) nest in hidden tree cavities, so don’t forget to check both limbs and trunks thoroughly before trimming or removing. Spring (and summer!) are busy baby season— procrastinate now! When is wildlife nesting? There is some variation, but most wild animals have their babies in March through August. If you can plan to trim your trees in the late fall and winter months, you can completely avoid the possibility of damaging a nest. It’s also a healthier time for the trees, when the sap has gone down and trees will be in their dormant phase. Call WildCare at 415-456-7283 if you’re unsure when it is a safe time to trim or remove a tree. In Northern California, most bird species nest through spring and summer. The great news is that birds fledge very quickly. If birds are nesting in an area of your garden that needs work, call our advice line (415-456-7283). Birds are federally protected, (including nests that are occupied by eggs or babies), and we can help you determine which species is in residence, and tell you how soon the babies will fledge and leave the nest. In most cases simply being patient for a couple of weeks is all it takes before you can safely (and legally) remove the nest. Click to read what to do if you find a baby bird! During the spring and summer months, WildCare’s phones will be ringing with calls about baby birds found on the ground. The first impulse of the kind-hearted is to rush a fallen baby to our Wildlife Hospital. Sometimes this saves a tiny life, but other times it’s actually “kidnapping.” Here’s what WildCare will be telling callers this spring. If a baby bird has fallen from a tree, first, be sure it is warm and protected, then call WildCare right away at 415-456-7283. Our 24-hour Living with Wildlife telephone advice staff can help you figure out how to do the right thing to help the little ones and maybe even reunite the wild family. Baby birds and mammals knocked from a nest that remains intact MAY be returned to their nests! A mother bird will continue to feed her babies after they have been handled by a person (although a bird may smell your scent on her baby, she will not be deterred from caring for it). However, if a baby is obviously injured or is cold, please follow the instructions on our Found an Animal page and bring it to WildCare or your local wildlife rehabilitator immediately. If a nest has been destroyed, a berry basket or small wicker basket can be wired to the branch where the nest was. However, the basket MUST be in exactly the same location as the nest, and ALL the babies must be together in the replacement nest. 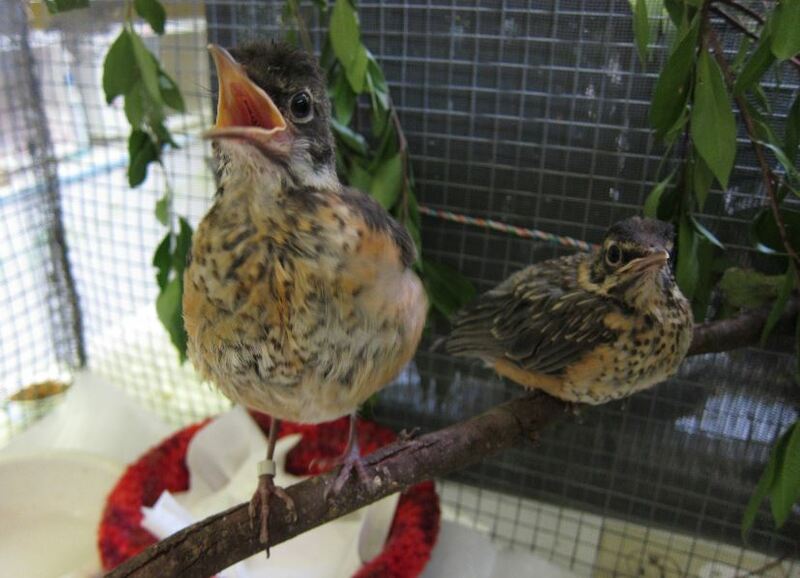 Parent birds will not feed nestlings in more than one location, so if the babies can’t be returned to the exact spot and be kept together, they should be brought to WildCare. The mother bird should be observed coming to the new nest within an hour, otherwise the babies should be brought to WildCare immediately. 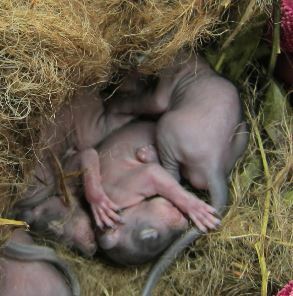 Orphaned babies will be raised at WildCare until they are ready for release back into the area where they were found. Property owners should postpone trimming trees if an active nest is present, or at the very least should trim carefully around the nest area. The time required for a bird to complete its nesting cycle varies by species, but most birds have active nests for 1 – 3 weeks, so delaying the cutting or trimming of trees shouldn’t be difficult. 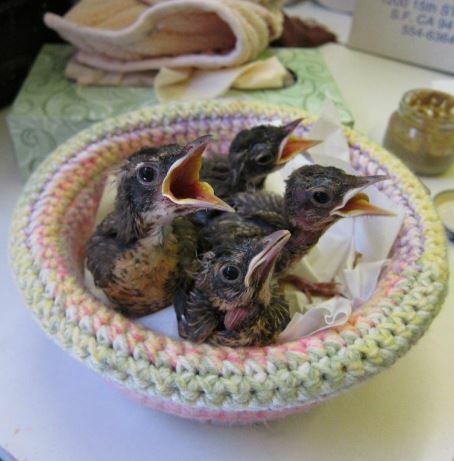 Contact WildCare’s Living with Wildlife Hotline at 415-456-SAVE (7283) for specific information on how long it will take for baby birds to leave the nest. Our operators have an extensive library of resources and can pinpoint very accurately the time when a nesting cycle will be finished (and tree-trimming will be appropriate) based on species and current age of nestlings.It really is best if you can take advantage of the autumn and winter to cut and trim trees, bushes and do other landscaping. And please remember you may always contact WildCare for advice.